Walmart, the largest retailer in the world, sells just about everything, but did you know they offer free samples and products as well? 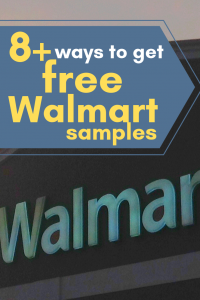 From Walmart.com to the brick and mortar store, brands constantly come to Walmart with millions of samples in hopes consumers like you sample the product and become a customer for life. There are also strategies you can use to take advantage of free full-sized items as well. And while samples aren’t always readily available, I wanted to share some tips you could use to increase your chances of snagging one. Apply some of these tips and hopefully, you can walk away with a sample or two today. In the past, Walmart.com used to have a free samples page that was dedicated to the free samples they currently had in stock, but sadly, they got rid of this page. While they still giveaway samples, you have to scour the web to find the samples and act fast because they can sometimes run out of stock in as little as 30 minutes. First, you’re going to want to set up a Google Alert, and if you haven’t done this before, make sure you’re logged into your Google account and head to Google.com/alerts. These Google alerts will alert you whenever your keyword shows up in a search result, usually from a news story. It can be anything you can think of, but here, we’re going to want to focus on Walmart free samples, of course. In the search bar, add the keyword, “Walmart free samples,” followed by your email to create the alert. Just make sure you use the email you check often because this is where your alert will arrive. You can also use other keywords if you wish, but this one keyword should yield enough results. Now, I recommend you set your options to send you an alert at least once a day to increase your chances of grabbing a sample before everyone else does, but this is entirely up to you. Once a week may show you some expired options, only leading to frustrations. Once you finally set your alert, you will then get an email whenever that keyword shows up online. It’s that simple. For example, when I was writing this, I received an alert from a Sun-Sentinel news article, saying that Walmart was giving away a free lens cloth and glass cleaner, equipped with a link I could follow. These samples will always vary, but by setting an alert, you can greatly increase your chances at snagging one before almost everyone else. I know you’re on this page for free samples, but what if I told you that you could get a free full-sized item instead? To get them, it’s actually not as hard as you think and only requires a coupon, that’s it! And, the great thing about this strategy is that you can use it at any big retailer. Known as coupon matchups in the coupon community, here’s how it works. First, you’re going to want to find a resource that finds the current Walmart sales and the current coupons on the market. Personally, I love theKrazyCouponLady.com. It’s easy to browse and updated daily. Next, you’re going to want to look at the coupon matchups for the week to see which items are on sale and which items you can use a coupon on to essentially get the item for free or even at a heavily discounted rate. The goal here is to find a coupon that offsets the entire sale price to essentially make the item free. As I’m writing this, there are 11 things I can get for free at Walmart for the week, according to the coupon matchup. Yes, 100% free as long as I have the coupon or the rebate form. Well, it depends, but these matchup pages always show you where you can get the deal. Let’s take these examples I found on theKrazyCouponLady.com. 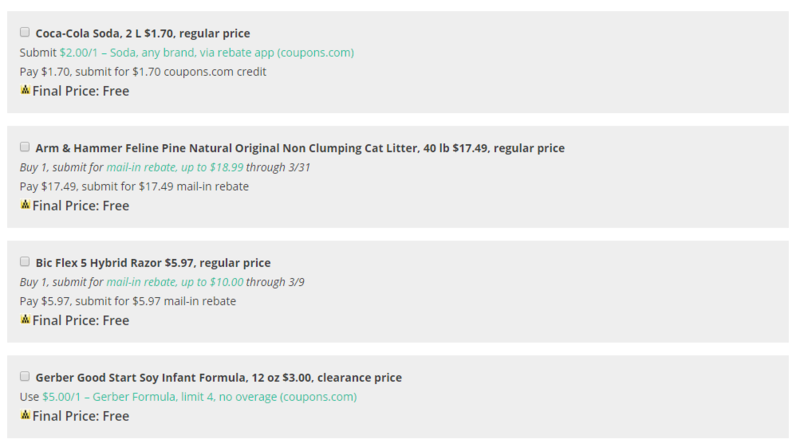 If you wanted the Coca-Cola soda for free, for example, you would need to print the $2 coupon from the Coupons.com website, but if you wanted the cat litter, you would need to fill out the rebate form they linked to. Most of the time, you can print out coupons right from your computer and can be done in a matter of seconds. It’s just up to you to know which items are on sale and which coupons you can use to essentially get the items for free. Thankfully, websites like theKrazyCouponLady does the dirty work for you, making it very easy to find freebies at Walmart almost weekly. You just need to print the coupons and bring it into the store. Out of all tips on this page, honestly, it’s one of my favorites. Not only can you get a free item, it’s going to be a full sized item, with NO sign-up forms necessary. As one last thing, this strategy can only be used in-store only, not online, since the cashier needs to scan the coupon’s bar code to give you the discount. This can be an obvious one, but Walmart does offer samples inside of the store quite a bit, but you just need to know when to go. 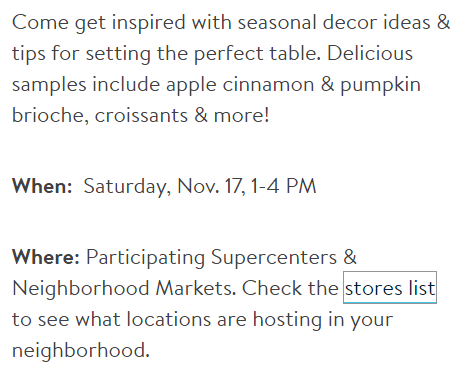 And, to know when, they actually post these events on their blog and Facebook page, letting you know when they are having an upcoming event. As you can see, they were offering delicious samples and much more, along with the date, time and stores participating. Aside from checking out the blog, samples inside the store can be random, but usually, you will have the best luck on weekend afternoons and during a holiday week/weekend, all of which are times when you can find stands inside the store. During this time, you will usually find representatives handing out samples at the end of the food aisles and sometimes in the refrigerated section. Usually, you will be able to find them standing at a table with a small banner above it with the brand’s name. Honestly, just look for the hordes of people since most love to hover around the sample tables. Finding free samples can be a lot of work. From researching to inputting your information and hoping for a free sample arriving at your doorstep, there are some items, such as the Walmart Beauty Box, that is worth the tiny investment. This box is just a sample of what you can get, so yours will be completely random. Regardless, if you like the idea of multiple beauty related samples landing on your doorstep from major brands, then to me, it’s well worth the investment. Said to cover the costs of shipping, again, you only have to pay $5 per box and it’s delivered right to your doorstep. 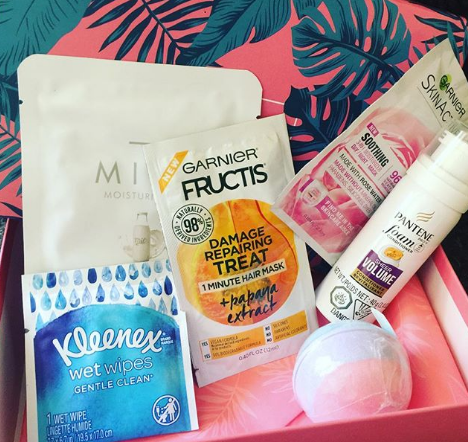 Just like the beauty box, the Walmart Baby Box works in the same way, only that these are baby product samples that come packed in a customized box. $5 a box, the baby box will include curated samples designed for your baby, which, according to Walmart, is based on your baby’s life stage and gender. As of now, the company offers three stages: pre-natal, newborn and toddler, and you’re given the chance to choose which stage you want at the time of ordering. Each box features a different brand and will be shipped off every time your baby graduates to the next milestone unless you cancel. While it’s not 100% free, it’s only $5 and includes a load of samples your baby is sure to enjoy. It isn’t guaranteed, but it doesn’t hurt to follow Walmart on one of their many social media channels to see if they post a freebie deal. While they have done so in the past, following them, much like creating the alerts mentioned earlier, could get you first dibs if you’re fast enough. Out of all social media profiles, I liked Facebook the best, simply because they listed the local events, which could increase your chances of getting a free sample in house, but it doesn’t hurt to follow the other pages as well to see what you can find. The internet is packed with millions of websites, and with this much information out there, it can be hard to find what you’re looking for. Thankfully, I helped you out and created a post just recently, showcasing 19+ websites that post legitimate freebies daily. I also wrote about 40+ scam-free websites that offer freebies as well. 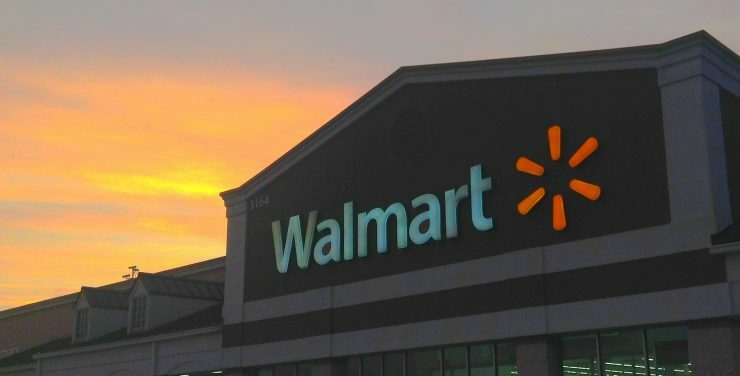 Not only will these websites post Walmart freebies, but they will post freebies available from thousands of other brands you’re probably familiar with. However, if you just want Walmart samples, all of these websites have a search bar, in which you can simply search for “Walmart” to see what freebies are currently active. And if you don’t want to refer to my past posts, that’s fine as I can recommend a few of my favorites here: r/freebies, Slickdeals, and TrySpree. Be sure to check out these freebie websites daily to see what kind of free samples you can sign up for. Google Alerts don’t always catch everything, and this is why I recommend you set yet another alert with the popular deals website, Slickdeals. Much like Google Alerts, Slickdeals will work in the same way, emailing you whenever your keyword shows up on the website. Creating an account is free, and to create your alert, head to the main page and look for the “deal alerts” tab located near the top. Once clicked, find the “create and manage deals alert” button to head to your alerts dashboard. On your dashboard, this is where you’re going to want to enter your keyword. Like Google Alerts, I recommend you use a similar keyword, such as “Walmart free samples” or even “Walmart free” to maximize your results. Adding yet another alert to your email should, again, increase your chances at snagging a Walmart free sample before anyone else does. Remember, they go fast! There are a variety of ways to get free samples at Walmart, but it’s going to take some work on your end. Personally, I think the best way to get free samples is definitely through the coupon matchup method. This way, you don’t have to worry about filling out forms or searching online in hopes your free sample arrives. Plus, it’s a full-sized item. And don’t forget about the beauty box, either. Even though it’s not 100% free, it only requires a $5 investment to cover the shipping and handling costs. If you’re a beauty fan, this is a tough one to pass on. For now, try out a few of these tips and let me know if you were able to succeed. As always, I love to hear from you, so be sure to share your thoughts below!